Robert Joseph "Bobby" Bare Jr. (born June 28, 1966) is an American singer-songwriter and musician. Bare was born in Nashville, Tennessee, the son of singer Jeannie Bare (née Sterling) and country musician Bobby Bare, Sr.. His parents met in 1963, when his father hired Bare's mother to join his act as a singer. Bare's mother, Jeannie, was a shopkeeper in Nashville. Bare has a younger brother, Shannon, and a younger sister, Angela. His older sister Cari Jean (Jeannie's daughter by an earlier marriage) died suddenly at age 15 from complications after surgery. Bare grew up in Hendersonville, Tennessee, a half an hour northeast of Nashville, where his family lived next door to Tammy Wynette and George Jones. He has a degree in psychology from the University of Tennessee. Bare has three children: daughter Isabella Bare, son Beckham Bare (from his first wife) and son Shelby Booker Bare (from his girlfriend). "[My dad] is three times the singer I am," says Bare Jr. "Once the audience sees him perform they'll realize I'm only using 10 percent of my genetic potential. I'll be exposed for my slacker attitude." In 1974, when Bobby was only eight, he and his father were both nominated for a Grammy for the song "Daddy What If", which was written by Shel Silverstein. Bare's daughter Isabella did a version of the song, which was featured on Twistable Turnable Man, a tribute album to Shel Silverstein which was co-produced by Bare and his father. He and his siblings also appeared on the TV show Hee Haw when he was a kid, to provide the witch scream on Bobby Bare, Sr.'s song "Marie Laveaux". He began playing guitar and songwriting, and started as a professional musician when he was about 30. Bare has said that he is someone who avoided "working a real job at any cost." He worked as a member of the road crew and as a light technician. Once he started writing and performing, he was offered contracts with Immortal Records and Lost Highway. In the 1990s, he led the roots rock outfit Bare, Jr., which was signed to Immortal Records, at that time the home of Korn and Incubus. They released two major label records, 1998's Boo-Tay and 2000's Brainwasher. He has performed with his band, the Young Criminals Starvation League, an ever-changing group of musicians, including members of Lambchop, ...And You Will Know Us by the Trail of Dead, and My Morning Jacket. They have released three studio albums, an EP, and a live album. His CD, Storm — A Tree — My Mother’s Head, was self-released through Bare's licensing company, 30 Tigers/Naked Albino Recordings, in 2010. The title of the record was inspired by a January 2008 storm in Nashville that injured his mother. "Mom was sitting on the couch, the last day of January in 2008, and there was a big, windy storm outside. And a big branch broke off halfway up the tree. It fell on the house, and literally split the house in two and landed exactly on top of her." Another song on the record, "The Sky Is The Ground," is about a bicycle accident his son had when he was two. Bare regularly performs in house concerts, often accompanied by the vocals of singer Carey Kotsionis. Shame on Me, a 2-song 7-inch vinyl record will be released by Big Legal Mess/Fat Possum Records in early 2014. Spring 2014 will see the release of new record on Bloodshot Records called Undefeated, and will feature a full band. The first single off the record, "The Big Time," was released as a preview before the official April 15 record launch. Bare recorded the album with Mark Nevers (Lambchop) and Grammy-winning engineer Vance Powell (Jack White, Alicia Keys, the Dixie Chicks, Buddy Guy). On the theme of the album: Bare "wrote the album about the end of his relationship with the mother of his youngest child, who is 3. The 10 rootsy Americana-style rock songs are at once poignant and shot through with mordant wit, which Bare said is a coping mechanism." Bare will be opening for Guided By Voices in June 2014. In February 2016, Bare joined a new touring lineup of Robert Pollard's band, Guided by Voices, as guitarist along with Nick Mitchell also on guitar, bassist Mark Shue and drummer Kevin March. Many of Bare's songs incorporate a lot of humor and references to popular culture. His writing has been characterized as "inventive and melodic." Shel Silverstein was a huge influence in his approach to songwriting. Bare describes it as writing poems and turning them into songs, which was very similar to what Silverstein did. 1974 Daddy, What If With his father Bobby Bare, Sr.
2000: Down to the Promised Land (compilation) (Bloodshot Records) – "Guitar Playing Woman" by Bare Jr.
2004: Sings Greatest Palace Music by Bonnie 'Prince' Billy (Drag City) – vocals on "Riding"
2005: Tanglewood Numbers by Silver Jews (Drag City) – vocals on "I'm Getting Back into Getting Back into You"
2005: The Moon Was Blue by Bobby Bare (Dualtone) – produced by Bare Jr.
2005: For a Decade of Sin: 11 Years of Bloodshot Records (compilation) (Bloodshot Records) – "Ocean Size" by Bobby Bare Jr.
2006: Bloodied But Unbowed: Bloodshot Records' Life In The Trenches (DVD) (Bloodshot Records) – videos for "Let's Rock and Roll" and "Flat Chested Girl From Maynardville". 2010: Twistable, Turnable Man: A Musical Tribute to the Songs of Shel Silverstein (Sugar Hill) – co-produced by Bare Jr. and father, Bare Sr.
A documentary that follows Bare's struggles as a touring musician is called Don't Follow Me (I'm Lost): A Film About Bobby Bare, Jr. William Miller, the documentary's director, and Lee Baker, the documentary's producer, joined Bare on the road for four months while touring in support of his 2010 release, A Storm – A Tree – My Mother’s Head. Musicians appearing in the film include My Morning Jacket, Justin Townes Earle, Hayes Carll, David Vandervelde, Blue Giant, Duane Denison and Bobby Bare Sr. The documentary was photographed on several formats, including Super 16mm, 16mm, Super 8, and HD and had its East Coast premiere at the CBGB Film Festival in October 2013. 1 2 "Bobby Bare Jr.". Discogs. Retrieved 4 October 2013. Real name: Robert Joseph Bare Jr.
↑ Petrusich, Amanda (2009-08-18). It Still Moves: Lost Songs, Lost Highways, and the Search for the Next American Music. Macmillan. pp. 98–. ISBN 9780865479043. Retrieved 24 June 2012. 1 2 Ratliff, Ben (October 25, 2005). "A Country Singer Returns to What Made Him a Star". New York Times. Retrieved 11 January 2014. 1 2 McCall, Cheryl (August 23, 1982). "To Hold His C&W Audience, Bobby Bare Is Usually 500 Miles Away from Home—or More". People Magazine. Retrieved 11 January 2014. 1 2 Boehm, Mike (November 11, 1998). "In the Cave of the Clan Bare: Raucous Bobby Jr. and Smooth Bobby Sr. Work in Different Worlds but Enjoy a Closeness". LA Times. Retrieved 4 October 2013. ↑ "Bobby Bare Jr. - About". BobbyBareJr.com. Retrieved 4 October 2013. 1 2 3 Blackstock, Peter (August 30, 2010). 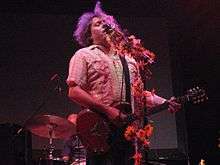 "Interview: Bobby Bare Jr.". emusic Q&A. emusic.com. Retrieved 4 October 2013. 1 2 3 Dunham, Nancy (September 2, 2010). "Bobby Bare Jr. Finds Humor in Unlikely Places Read More: Bobby Bare Jr. Finds Humor in Unlikely Places". The Boot. Retrieved 11 January 2014. ↑ Downing, Andy (May 26, 2006). "Bobby Bare Sr. and son tackle uncharted country". Chicago Tribune. Retrieved 11 January 2014. ↑ Pandolfi, Elizabeth (April 24, 2013). "Bobby Bare Jr. carries on Shel Silverstein's legacy: Bare in there". Charleston City Paper. Retrieved 4 October 2013. ↑ "Bobby Bare Jr. & Isabella Bare - Daddy, What If". YouTube. Jun 24, 2010. ↑ Kopet, Jeri (September 12, 2013). "Grin and Bare It". Anchorage Press. Arts & Entertainment > Music. Archived from the original on September 16, 2013. Retrieved May 30, 2015. ↑ Riemenschneider, Chris (February 7, 2013). "Bobby Bare Jr. bares all". Star Tribune. Retrieved 4 October 2013. ↑ Fortunato, John. "Bare Jr.'s 'Brainwasher' Turn Heads". beermelodies: For Beer Geeks And Rock Freaks. Retrieved 4 October 2013. ↑ "Bobby Bare Jr. - House Concerts". BobbyBareJr.com. Retrieved 4 October 2013. ↑ Feldman, Dave (January 20, 2011). "Live in JC: Bobby Bare Jr. Gets Intimate at Jersey City Apartment Show". Jersey City Independent. Retrieved 4 October 2013. ↑ "Bobby Bare Jr.: A Nashville Heir Charts His Own Path". WNYC Soundcheck. January 6, 2014. Retrieved 11 January 2014. ↑ Portman, Jed (April 3, 2014). "Southern Sounds - First Listen: Bobby Bare Jr.". Garden & Gun. Retrieved 3 April 2014. 1 2 Danton, Eric R. (8 April 2014). "Bobby Bare Jr. Sorts Through 'Scary Stuff' on 'Undefeated' (Album Premiere)". Wall Street Journal. Retrieved 8 April 2014. ↑ Gold, Adam (9 February 2016). "Tweet of the Week: Bobby Bare Jr. Joins Rebooted Guided by Voices". Nashville Scene. Retrieved 26 February 2016. ↑ Minsker, Evan (9 February 2016). "Guided By Voices Are Back in Action: Pollard playing every instrument on new LP, but there's a new live lineup". Pitchfork Media. Retrieved 26 February 2016. ↑ Jacobson, Alan (2010). "A Soul Bared: Bobby Bare Jr. is at the End of His Leash". Third Coast Press. Retrieved 4 October 2013. 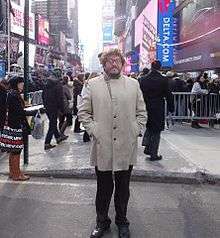 ↑ Ochs, Meredith (November 20, 2006). "Bobby Bare Jr.'s Music Falls Far from the Tree". NPR Music - All Things Considered. NPR. Retrieved 4 October 2013. ...Bare's music manages to be both inventive and melodic, from his unpredictable arrangements to the deliberate phrasing that defines his singing style. 1 2 "Bobby Bare Jr., Don't Follow Me (I'm Lost), Interview — Don't Follow Me (I'm Lost): The Dynamic of Bobby Bare Jr.". The Nashional. April 28, 2012. Retrieved 4 October 2013. ↑ "Why make a film on Bobby Bare Jr?". Don't Follow Me (I'm Lost). Retrieved 4 October 2013. ↑ "About". Don't Follow Me (I'm Lost) Film blog. Retrieved 4 October 2013. ↑ "CBGB Festival: Film Screenings". Don't Follow Me (I'm Lost). CBGB Festival. Retrieved 4 October 2013. ↑ "Dont Follow Me Im Lost - Sunshine - CBGB Film Festival". Brown Paper Tickets. Landmark's Sunshine Cinema, New York, NY. Oct 10, 2013. Retrieved 4 October 2013. Wikimedia Commons has media related to Bobby Bare, Jr..